I always know summer is almost here when I get a notification from Sync about their upcoming season of free YA audiobooks. So, starting this Thursday, April 25th you can starting downloading a terrific list of YA reads that you can listen to at home, in the garden, on the bus, in the car, on a plane, while exercising...well, you get the idea. This is an incredible list. The first two books have been on my To-Read-List for a while and I know I'll final get to them. 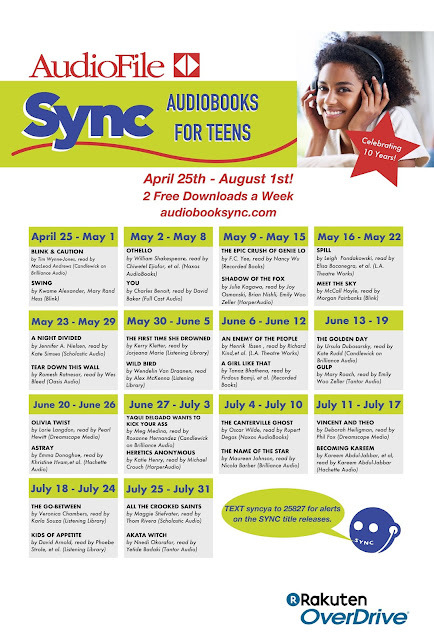 So, check out this fantastic opportunity and load up on free audiobooks. 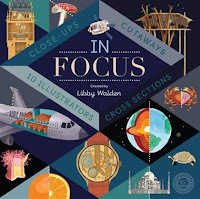 Paula Hollohan is my guest blogger today raving about a recent addition to the Doucette Library's collection that has great classroom potential, connecting to STEM, science and language arts. Thanks, Paula. 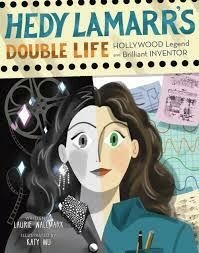 It is really not about the glamorous life she led or the amazing inventions. This story captures the curious mind of a girl and a woman about things that were happening around her - in her real life. I find the story about Orson Welles’ 1938 radio production of the War of the Worlds and its impact on many Americans who had tuned into their favourite radio program, utterly fascinating. On October 30th, 1938 (Halloween Eve or Mischief Night) the American public were about to get punked big time. The story goes, that Orson Welles and the players of the Mercury Theater had adapted the novel by H.G. Wells, The War of the Worlds, into a radio play. The play was presented as if it was taking place in ‘real time’ with credible sounding newscasters describing the unfolding invasion of aliens in Grovers Mill, New Jersey. Many of the listening audience thought the story was true and panicked, thinking they were about to be captured or killed by Martians. Police were called, hospitals were overrun, switchboards at CBS and other media were swamped with calls, and people were running amok in the streets. The story goes viral. Fascinating, right? Spooked! : How a Radio Broadcast and The War of the World Sparked the1938 Invasion of America by Gail Jarrow presents an absorbing account of how this all came to be, played out in reality and the aftermath. It is a well-researched book that frames the context of the radio play in terms of the mindset of the American people at this time (post-Depression era, increasing unease over the rise of Nazism in Europe, increasing interest in Mars) and why it was seemingly, possible to dupe the public. But the book goes beyond looking at the radio play and its unintended consequences. It also explores the characters involved in the production, the public’s response and it looks at the media’s coverage of the aftermath, presenting another angle of fake news. The mass hysteria that supposedly gripped the nation after the play’s broadcast was greatly exaggerated. The studies done at the time are shown to be inaccurate and then wrongly reported. 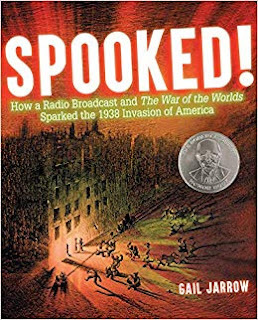 This book presents a terrific historical case study to bring into the classroom to look at fake news today, understanding how the media can slant a story and the importance of critical thinking. The book includes sections of the radio broadcast, descriptions of how the play was read, the pacing, the music, the characters, as well as excerpts from letters, telegrams and editorials sent to CBS, Orson Welles, newspapers describing the impact it had on listeners. The breakdown of the myth of mass hysteria shows how to work through information and fact check. Additional material such as a timeline, a list of web resources, an author’s note, source notes, a selected bibliography and an index provides substantial support for students to follow up and explore the story on their own. You’ll be happy to know that there is a link to a site that has the original radio play for you to listen to. Gail Jarrow does an amazing job with all her books. As already mentioned, they are well-researched. She picks stories that allow us to connect on an emotional level to the people involved and then gets us thinking. I highly recommend this book for middle grades and up. This is sort of a Public Service Announcement, letting those of you who frequent the Pinterest page for the Doucette Library, that I’ve added one more. The latest addition is for Social and Emotional Learning, K-3. Both Paula (co-worker) and I have been fielding a few more questions and requests for picture books that touch on these topics. We’ve also noticed a few more lists of picture books focused on these areas appearing lately, too. The Pinterest boards that I’ve set up, typically are of books and resources found in the Doucette Library. This ensures that student-teachers will be able to track down those resources, specifically. I went to Alberta Education’s website to see how they were defining this kind of learning and decided to base my selection of books on this. The Overview framed social-emotional learning as working with others, building resiliency, achieving goals, and reducing bullying. 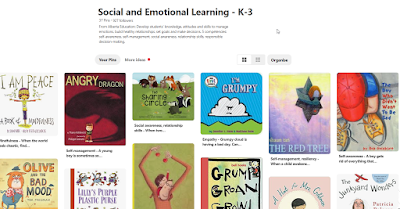 They’ve highlighted five competencies that connect to social-emotional learning, too and include self-awareness, self-management, social awareness, relationship skills and responsible decision making. There are many concepts that fall into these competencies as well such as empathy, mindfulness, managing stress, communication skills, and conflict resolution to name a few. These are some of the terms that helped me frame my selection of picture books for this board. Let me know what you think or if you have some recommendations. I'm adding to this daily as new titles pop into my head. I'd love to have some input. A couple of nonfiction books that recently caught my eye are from the publisher 360 degrees. What I liked their approach to lift-the-flap books for older kids. In Focus: Close-ups, Cutaways, Cross Sections, 10 Illustrators created by Libby Walden is a general information book that covers a range of topics from both the natural and human-made worlds in a unique way. Each double spread focuses on a theme providing a random but interesting selection of facts about the creatures or things represented. These two pages then fold out to a four page spread to take the reader even deeper into the facts. For example, the first spread is about the ocean. Featured are various sea creatures such as the blue whale, sea horse, puffer fish, swordfish, jellyfish and starfish, to name a few. We learn a pertinent fact or two about the animals from the front pages such as the blue whale is the largest animal to have ever lived on the planet and typically lives between 80 to 90 years. Or that starfish are not fish and though commonly seen with 5 arms they can have as many as 40. Or that jellyfish have been around more than 650 million years! Flipping open the top pages, we see cross sections of the animals exposing their skeletons and internal organs. From here, there is more detailed information. Did you know that the heart of the blue whale is the size of a small car weighing in at 770 kg or 1550 lbs? Amazing. Topics covered are: the physical structure of homes found worldwide, space and space vehicles, international landmarks, various plants, animals and geological features, everyday objects, well-known buildings from around the world, fruits and vegetables, land animals and modes of transportation. Wide ranging, indeed. 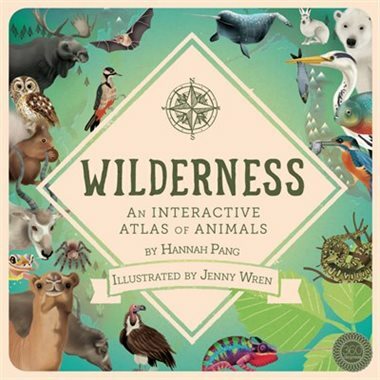 The second book is Wilderness: an Interactive Atlas of Animals by Hannah Pang. 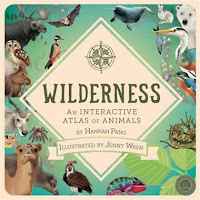 This one also uses flaps, pop ups and spinning wheels to engage readers about an array of animals from all continents both land and water. The formats are the draw here and there are many of these kinds of trivia/random information books out there. The illustrations are well done and support the informational tidbits. I see these as interesting resources for classrooms but not necessarily crucial. These books will appeal to some kids and could be used in centres or for individual reading time. Elementary and middle grade students are the best audience for these books. 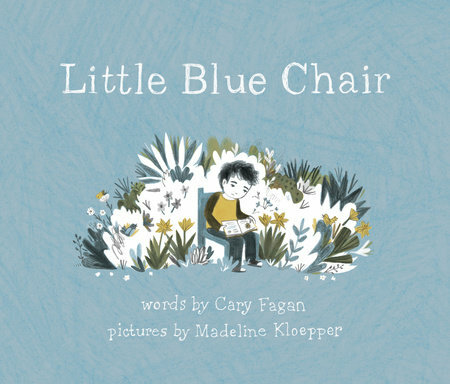 I’ve just been working my way through a cart of new books to be added to the Doucette Library’s collection and really enjoyed, Little Blue Chair by Cary Fagan, illustrated by Madeline Kloepper. It’s a wonderful example of a circular story that leaves the reader feeling content that everything has a time and place and things will end up as they should. 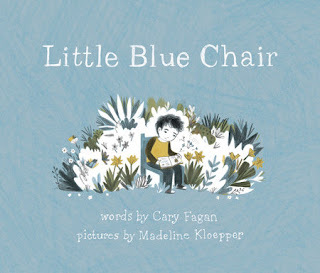 So, there’s a little boy named Boo with a little blue chair that is very much part everything he does in a day – sitting for reading and eating both inside and out, playing and even sleeping. But when he out grows his chair, his mother places the chair on the curb with a note to offering it to someone else. We follow the chair’s journey to various homes, having varying purposes and living with several people who make use of the chair. It has a very rich and varied life, if chairs have lives, from the exotic to the mundane, traveling over land, sea and air, ‘working’ in a carnival, as a seat for riding an elephant, a bird feeder, a plant stand and a child’s chair. But, circumstances allow for the chair to serendipitously arrive at the door of a man named Boo who thinks this chair looks kind of familiar. The illustrations have a simple, old-fashion feel to it with a muted palette of colours. The book conveys a more practical sensibility rather than nostalgic about the ever changing purpose of this particular chair. It's a good thing that this chair changes hands and remains useful rather than being discarded or kept to become clutter. This would make a great read aloud for grades Kindergarten to grade 2 or 3. I am the reference coordinator at The Doucette Library of Teaching Resources, a curriculum library in the Werklund School of Education at the University of Calgary. I love connecting education students and teachers with engaging and exciting resources for classroom teaching. I believe that resources that get me excited (or those that get you excited) are the ones with the best potential to get kids interested in learning about - well, everything. Finding those books that connect to the real world are the ones I enjoy promoting the most. Visit Tammy Flanders's profile on Pinterest. This is year is complete, folks. Come back next summer.